… here in Fredericksburg. We have two of his paintings here in the house and thus, naturally, I welcomed the opportunity to meet the artist himself. I went there yesterday but it was ever so crowded, maybe because it was First Friday Art Walk here, and so I left. This afternoon I returned, hoping it wouldn’t be as crowded as yesterday. And I was not disappointed: for quite a while I was the only guest there and thus had the artist all for myself. 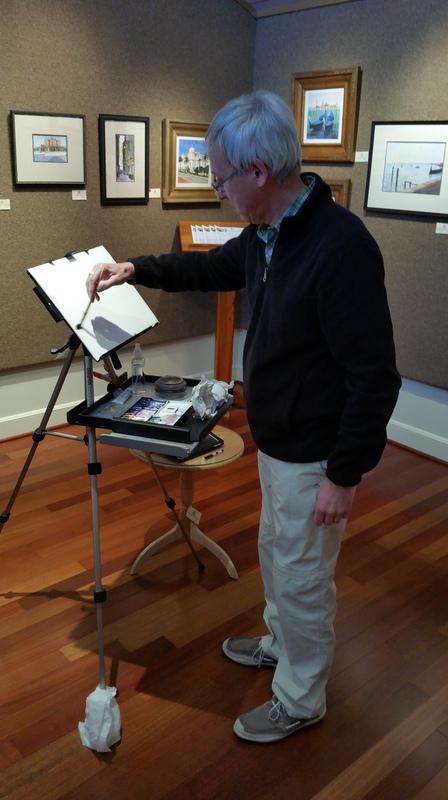 What a pleasant opportunity to talk to a very pleasant great artist and watch him do a demonstration of his art! Later, a few more people showed up, but not that many to make the room crowded. It was quite interesting to listen to the ensuing discussion, all the while watching the painting “grow”. Gestern Abend und heute Nachmittag gab es die Gelegenheit, in der RS Hanna Galerie hier in Fredericksburg dem schottischen Maler Colin Joyce bei einer Demonstration seiner Arbeit zuzusehen. Wir haben zwei seiner Aquarelle hier in unserem Haus und daher war ich natürlich ungemein an der Gelegenheit interessiert, den Künstler selber kennenzulernen. Also bin ich gestern hin, aber nach kurzer Zeit wieder weg, denn – möglicherweise bedingt dadurch, dass es der Freitag des First Friday Art Walk war – es war echt überfuellt. Heute Nachmittag bin ich wieder hin, in der Hoffnung, dass es nicht so voll sein würde, und ich wurde nicht enttäuscht. Für eine ganze Weile war ich der einzige Gast und hatte den Kuenstler so für mich ganz alleine. Was für eine herrliche Gelegenheit, sich mit einem großartigen und umgänglichen Künstler zu unterhalten und ihm bei seinem Schaffen zuzusehen! Später kamen dann doch noch ein paar Leute mehr dazu, aber es war niemals voll, und es war interessant, der sich entspinnenden Diskussion zuzuhören und dabei das Werk sozusagen “wachsen” zu sehen. Move the cursor over a picture to see the caption. A click on any of the pictures in the gallery will open a slide show. Those views will also allow you to read some of the exif-data, see the picture in its full resolution and leave a comment. Um die Bildunterschrift zu sehen genügt es, den Cursor über ein Bild zu bewegen. Ein Klick auf eines der Bilder in der Galerie öffnet diese dann als Diashow. Diese Ansichten erlauben es, Exif-Daten zum Bild einzusehen, das jeweilige Bild in voller Auflösung anzusehen und auch einen Kommentar zu hinterlassen. It was a great afternoon, and I’m happy I went. Es war ein prima Nachmittag, und ich bin froh, hingegangen zu sein. 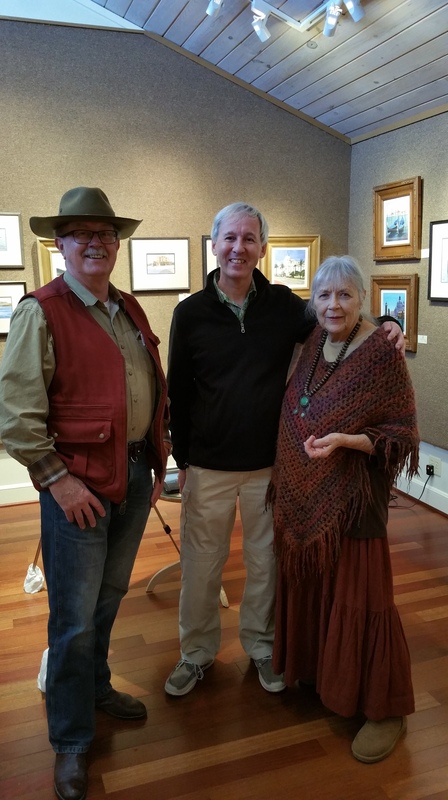 This entry was posted in cultural Fredericksburg, First Friday Art Walk, galleries, pictures, RS Hanna Gallery and tagged Colin Joyce, Fredericksburg, watercolours. Bookmark the permalink. Sounds like an interesting time. I’m always awed by artistic talent. It certainly was an interesting time. An afternoon well spent. Really amazing to see that picture develop. And so great to be able to talk to the artist while he was painting. What a talented artist he is! Hi lieber Pit, das finde ich auch. Es ist immer toll, inspirierend und bereichernd Künstler in action zu erleben. ich bin froh, dass ich hingegangen bin. Ich wuenschte, ich koennte das oefters erleben. Mal sehen, was sie da in der Galerie [oder auch in anderen hier vor Ort, den Fredericksburg ist mit Kuenstlern und Galerien reichlich gesegnet] anbieten. Uebrigens: Ihr seid ja naeher dran als ich. Ihr koenntet Colin ja mal in Edinburgh besuchen. Oder wenn er anderswo in England Workshops abhaelt. Ich meine mich zu erinnern, dass er (bald) nach Nottingham kommen will. Und wie waer’s: ladet ihn doch mal nach Cley ein. 😉 Da gibt’s doch Motive ueber Motive fuer ihn. es war wirklich Klasse, ihm zusehen zu koennen. Und wesentlich besser als am Tag zuvor. Colin hat mehrfach betont, dass er da, wegen des Massenandrangs, nicht mit den Leuten reden konnte und sogar kaum Platz hatte zum Malen. P.S. : “Never give up” sollte ich mir hinter den Spiegel schreiben, wie man so sagt, denn manchmal werfe ich die Flinte zu schnell ins Korn. Aber am Freitag war es richtig abzuhauen. Woohoo! Scottish artist – I followed the links to his website and saw some places I know. We also have some paintings done by artists we have met (some by friends, some through galleries as here) and I think it adds an extra dimension to the art if you can look at it and think of the person. Yes, imagine: A German meeting a Scottish artist in Texas! Quite international, isn’t it? Well, who knows. Maybe I’ll be able to visit him in his home country some time. Ever since we visited Edinburgh in 2013, my wife and I have wanted to come back to Scotland. But there’s so much else on the bucket list. Well, who knows. The Highlands are definitely calling. P.S. : I’m just now looking at pictures from that trip and enjoying remembering that a lot. Super. Dir einen schönen Sonntag. L.G. Yep, wie man hier so sagt: es war super. Das stelle ich mir sehr interessant vor, zu sehen, wie ein Bild entsteht, wie der Künstler das macht. Ich gucke so was manchmal auf YouTube. es war wirklich hochinteressant. Gnaz besonders deswegen, weil man sich staendig mit dem Kuenstler unterhalten konnte, und er einem auch die Technik erlaeuterte. Das ist natürlich noch einen Tick besser als bei YouTube. 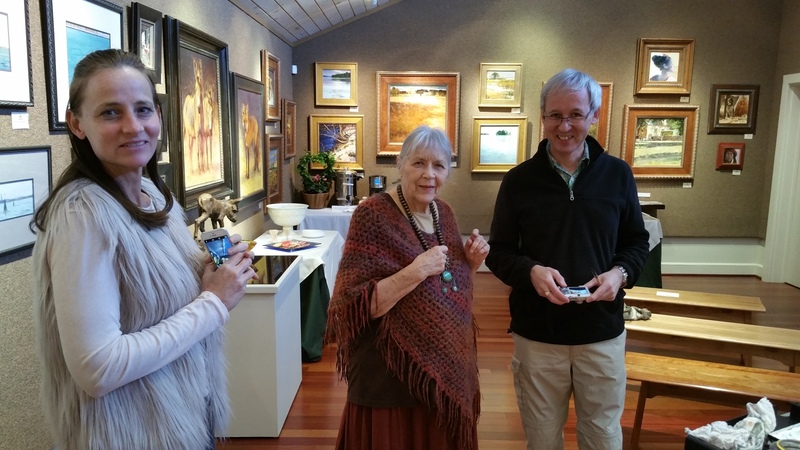 I’ve not heard of this gallery in Fredericksburg, nor of the town’s First Friday Art Walk. In Austin on the first weekend in the month there are often openings of shows in art galleries. That was true last night, when we attended three of them. When I googled “First Friday Art Walk”, I found out that Austin has one, too. So you went to three galleries/shows even. FFAWs are something we like – great opportunities to visit the galleries. RS Hanna’s is one we like, but definitely not the only one. You’re welcome, Amy. I certainly had a wonderful time there. Ever so interesting. es war echt faszinierend, ihm zuzuschauen, und ich bin soooooooo neidisch geworden, dass ich das nicht kann. Dabei sah es so einfach aus! Dass es in Deutschland sehr stark weht und dass deshalb einige Karnevalszüge [der in Köln aber nicht] abgesagt worden sind, das habe ich auch mitgekriegt. Hier ist es auch ganz schön windig – zumindest zu stark und dazu noch kalt ais dem Norden als das ich mich auf’s Rad schwingen möchte. Thanks, Edyth, for stopping by to visit my blog and for writing a comment. 🙂 I’m glad you enjoed my article(s) and the photos. Btw, there are more pictures on my second blog, “Pit’s Bilderbuch” [https://pitsbilderbuch.wordpress.com/]. I hope we’ll have bluebonnets (and other wildflowers) to take pictures of. We need more rain for that, don’t we? Colin is a gifted artist and your gallery looks mighty fine as well! Sounds like a wonderful time was had by all! Beautiful painting. Yes, we did have a great time there. And the painting is sure beautiful. I know it was quite some time without (much) blogging here. But I did post a few pictures in my other blog [https://pitsbilderbuch.wordpress.com/]. Plus two posts here [pictures from my bicycling routes: http://tinyurl.com/zzwlesz & http://tinyurl.com/joyfauz%5D. Thank you Pit for sharing your experience and fantastic photos of Colin Joyce’s demonstration. We’ll look forward to your next visit to RS Hanna Gallery. You’re welcome, Shannon. And thanks for mentioning my blog in yours. 🙂 Much appreciated. Btw, I believe the e-mail address on the gallery’s website isn’t working. I tried to send you an e-mail twice at tyhe weekend, and it was returned as undeliverable. I am a member of Dunfermline Art Club in Scotland where Colin tutors our watercolour group. I have found him to be a fantastic teacher and an inspiration and have improved tremendously with his help. So glad you enjoyed his demo. You are obviously almost as big a fan as me! Thanks for taking your time to stop by at my blog and leave a comment. 🙂 As to being a fan of Colin: yes, last Saturday I became one. Well, actually we had seen and bought two of his water colours here at the Hanna gallery last year. So both of us, my wife and I, were fans of his (pictures) already before I had the opportunity to meet him in person. It was fantastic to see a picture “grow”! Thanks for introducing me to Colin. I wasn’t familiar with him, but like what I see and have subscribed to his newsletter. So cool! How long did it take him to paint that picture? It took Colin less than 2 hours. I was inmpressed. That really is impressive – I figured it couldn’t have been too long if you saw the whole process, but still, that’s quick! It’s really quick. I was quite surprised, too.